I had to go twice to the magnolia grove at the brooklyn botanical garden this past week, for several reasons not worth mentioning. Once with my camera once without. Both days were gloomy - cold, loamy types of spring days. Been lots of talk around these parts about spring not springing this year. I snicker; this is my kind of spring. The kind of spring that takes the time to do it right. This is a cold spring that slowy unfurls and demands distinct attention HARK! the latency of nature's majesty revealed in languid tones. A metronome. A distant GONG! reverberating with the slow swelling we know so well from time lapse nature films. Something is happening. 70 degree days - STAY AWAY! I figure it's time well taken, and there is a lesson in all this for me. I can learn to appreciate slow things, things that progress with pace. Another drizzly 50 degree day is another day we get to observe the phenomenon. Like doctors behind glass in an theatre, as city-dwellers we tend to observe spring with cannon's and macro lenses at the helm. But a funny thing I've come to realize about nature is that you can't always take it with you. I love this kind of spring, too. It's been a little warmer here in DC, but today reminded me of this William Carlos Williams poem. It's commonly called "Spring and All" but that's really the title of the book it comes from. yes to the snip, snip, snap away without actually getting the chance to enjoy and see through to the broader frame, bigger picture. we're 92F here in Austin and it's barely April. I'd take some grey. How I dread the ninety degree day that always comes in April. It completely ruins the slow opening of Spring. Love your photos, Sarah. there is value in looking through the lens, and in looking with the naked eye. two very different visions. so beautifully captured. thank you for sharing these gorgeous images. we love your work! I'm with you. The pain of graduate school has been 20-credit courseloads and teaching on top every winter quarter. I love the lean slow stirrings of january and february, makes me miss the fields back home in western Oregon. That time of year it's just shoots of delicate green and mostly the lean withered stalks, memories of last year, amid mud and bare branches. I like having time to watch the moss grow on the bark, feel the balance tip s-l-o-w-l-y toward summer. No headlong plunge needed. Spring is at her best when she is cold, chaste, aloof; against those stormy threatening skies her blossoms glow with a subtle seduction that is flattened and lost in bright sun. This is the most beautifully written post. You are right. I love warm weather as soon as it will get here. But down here in NC, it always gets warm and the flowers unfurl. 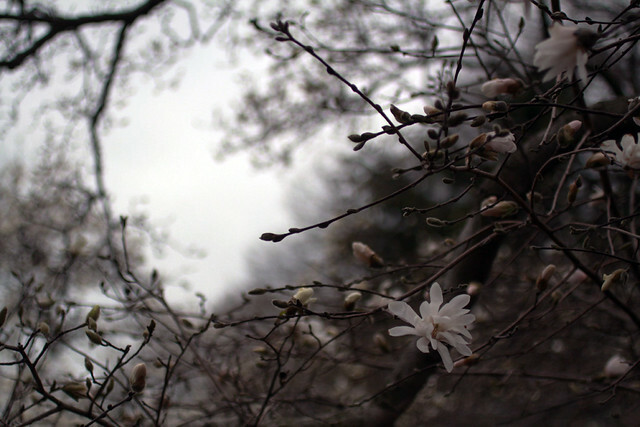 And then the weather dips again and kills all the delicate blooms. It's sad. 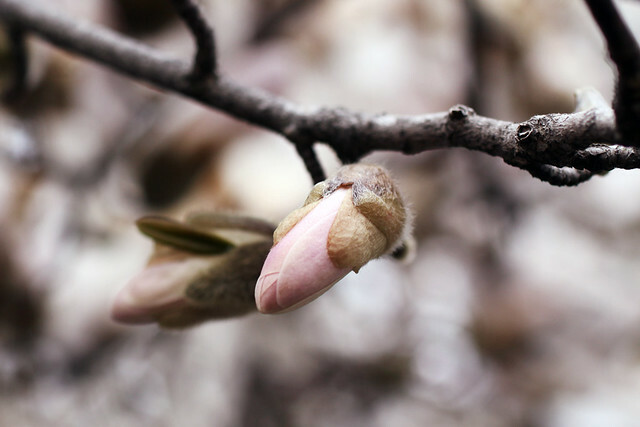 I watched the prettiest pink magnolia tree go from royal splendor to a shivering brown mess last week. It made my heart hurt. lovely, Sarah. and thank you, Miriam, for the Williams poem. So well put. And photographed, as always. My exercise this year is to not try to record everything. To be at ease with letting my brain record it and not my camera. How much do you experience something through a lens? Sometimes a camera heightens an experience, and sometimes a camera takes away from it. 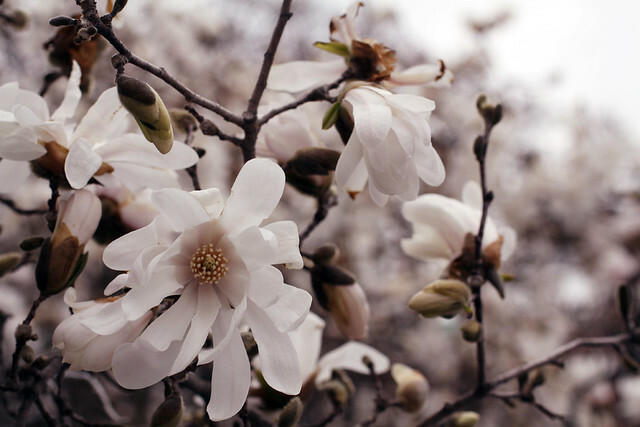 these photos of the Magnolias are soooo beautiful. Alas, LA doesn't have anything like it. that warm one we had the other day really bummed us out. for the first time in maybe forever, i actually do not want summer to come. if only spring could unfurl forever! Mothers are the flagships for world of love and concern. A mother is the one and only relationship we live for. Very few relations are there in life that can stand the challenge of time, and the mutual relationship with Mother surely tops the list of them. It’s the relationship that expects nothing from you, keeps loving you every moment, and stays with you for the rest of your life. Visit www.flowerdeliveryindia.com/mothers_day_gifts_delivery_in_india.asp for more details. Well said! 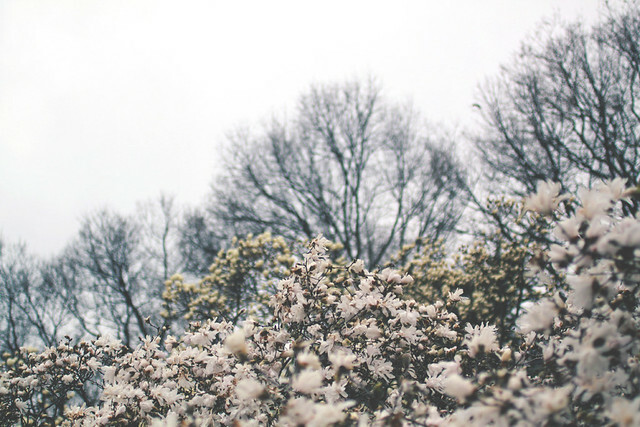 Great post--I love reading about spring on the east coast. It is still dull here in Wisconsin. i love all of these words. I'm not sure which I prefer, your post or all of the flowers-to-india spam about mother's day in the comments! moody photos and insightful words. just right. Aaaaaah Sarah. Those mags are RIDICULOUS. Thanks for this one, Sarah. I keep trying to tell my people this, but all they want are the 80 degree days that come around and blast all the beauty away. I'll take the grey April days anytime. Philly love to you! This is just too exquisite! It has been a real spring, which i appreciate as well. I asked the old Romanian flower man at Union Square how he was feeling this morning, as I bought some fragrant pheasant's eye narcissus. He told me that he's lately been reconsidering how he answers this question, and he's realized that he's actually always elated, just to be alive. It was a perfect moment.